"I see myself as continuing a strong ceramic tradition of borrowing ideas, for both form and surface, from examples found in other media. I enjoy being flippant and subversive, making fusions of seemingly disparate historical and contemporary subjects in an attempt to achieve a balance between the high and the lowbrow, the reverent and the irreverent, the sophisticated and the crude." Philip Eglin’s expressive ceramic work reflects and comments on contemporary culture. His work is laden with eclectic cultural references: from religion to football, from medieval woodcarving to the symbols used in contemporary packaging, from Chinese porcelain to English folk ceramics. His ceramics tell a story, each one has the power to provoke emotion and to challenge. 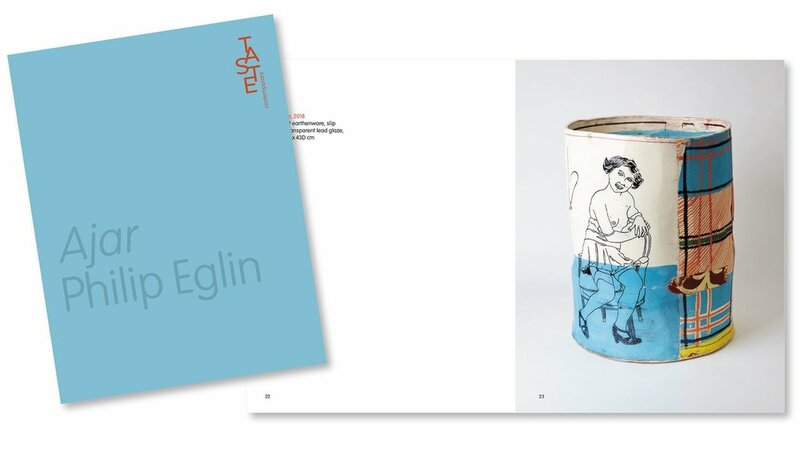 Philip Eglin’s post-modern aesthetic draws on many sources from popular culture and ceramic history through to high art and from Gothic Madonnas to Abstract Expressionist painters of the 1950s. Frequent use of graffiti elements carry playful references to street culture and his sculptures often incorporate pieces moulded from everyday objects such as coke bottles or throw-away plastic. Although most noted for his figures, he also makes large bucket-vessels and more recently has created installations of jugs, which evoke medieval forms. Eglin produces work on a range of scales in earthenware and stoneware from small functional vessels to large figurative, sculptural works. Philip Eglin studied at Staffordshire Polytechnic and the Royal College of Art, London. He was winner of the prestigious Jerwood Prize for Applied Arts in 1996 and exhibits internationally. His work is held in numerous, major public and private collections including the Stedelijk Museum in the Netherlands, the Mint Museum in North Carolina, USA, the Fitzwilliam Museum in Cambridge, the British Council and Victoria and Albert Museum in London.